The desire to become a "better" value investor is arguably one of the most popular discussions of the day amongst the value investing click. I have an MBA degree and I am very proud of it and the school I earned it from. But MBA school did not directly contribute to my becoming a better investor. An MBA has aided me in several invaluable ways, but I'm not here to talk about that. Instead, to become a better investor you need to be able to do one thing and one thing only: THINK RATIONALLY. Unfortunately, this is not an easy task and no MBA class (at least to my knowledge) trains someone how to really think practically. While I was somewhat disappointed with the quality of questions at this years Berkshire Hathaway meeting, you can always count on Buffett to deliver. One of this year's gems was when Buffett commented on the fact that nearly all business schools do nothing to train students to become better investors. 2. Learn how to think about stock markets and understand volatility. 2. Interpreting market volatility as a destroyer of opportunity when it is instead a creator of opportunity. If your approach is sound then volatility allows you to buy that which was cheap yesterday cheaper today. If you can truly learn about evaluating businesses and understand that the market is here to serve you and not guide you, your investment performance will truly be off the charts. If you understand the two concepts Buffett noted above, you will be able to clearly apply the following framework, which I believe is the simplest and most effective way at approaching the stock market. 6. Make a significant investment at the maximum point of pessimism. 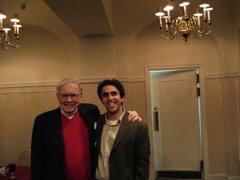 Find me a successful investor (Buffett, Berkowitz, Hawkins, Pabrai, Einhorn, etc.) and I'll show you an investor who performs all of the above.